Editor-in-Chief Harish Khare ‘offered to quit’ after Tribune trust forced apology; president Sodhi replaced with N.N. Vohra at 3 November meeting. Chandigarh: In a dramatic development that will shake the Indian media industry, Jammu and Kashmir Governor N.N. 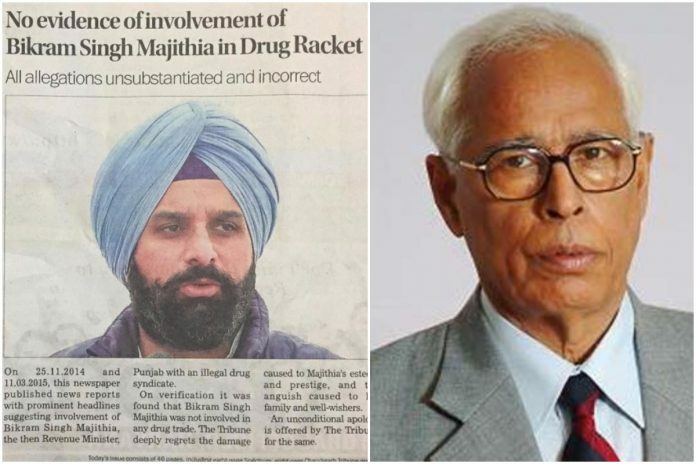 Vohra has taken over as president of the managing trust that runs The Tribune newspaper following an internal uproar over the newspaper issuing an apology to former Punjab revenue minister Bikram Singh Majithia for publishing two stories about his alleged links with drug lords. Also, Editor-in-Chief of the newspaper, Harish Khare, offered his resignation in protest after the apology was forced upon him from the top, highly reliable sources told ThePrint. The Tribune trust was then headed by Justice (retd.) S.S. Sodhi. Facing a defamation case filed by Majithia, The Tribune published a three column apology on its front page on 29 October which said Majithia was not involved in any drug trade and all allegations against him were unsubstantiated and incorrect. Sodhi, it is learnt, played a key role in the out-of-court settlement the newspaper reached with Majithia. The apology is said to have sparked major unhappiness within the newspaper. The Tribune employees’ union rejected the apology and demanded the trust fix responsibility for publishing it. The Tribune Trust that met on 3 November to take a decision on Khare’s offer to quit replaced Sodhi with Vohra, who was second in line for the post, as president. The trust is due to meet again 11 November to consider withdrawing the apology to Majithia, the sources said. There was no response from both Sodhi and Khare to requests from ThePrint for their comments until the time of publication. This report will be updated when they respond. The Tribune’s apology was seen as vindication for Majithia as he had claimed that he had been politically targeted. “I thank The Tribune for graciously offering an unconditional apology for all the allegations levelled against me on the drug issue. For years, I and my family spent every day and night suffering a painful and harrowing time for being falsely targeted with wildest allegations,” he wrote on his Facebook page on the day it was published. Majithia became the favourite whipping boy of the Congress and the Aam Aadmi Party ever since the Punjab Police arrested Jagdish Bhola, a cop and wrestler-turned-drug lord, and two Amritsar-based businessmen, Maninder Singh alias Bittu Aulakh and Jagjit Singh Chahal, in November 2013. Aulakh and Chahal named Majithia during questioning by the enforcement directorate (ED) in a related case. Majithia, then revenue minister, was questioned by the ED in December 2014. While the investigation in the case is still underway, Majithia has not been mentioned in any of the six prosecution complaints filed by the ED in the court so far, the latest being in July this year. AAP made Majithia’s alleged involvement in the drug trade a big focus of its election campaign, promising to jail him “within days” of coming to power. Majithia vehemently denied the allegations, and went on a spree filing defamation cases. Apart from the defamation case against The Tribune filed in Amritsar through then editor-in-chief Raj Chengappa for stories published during his tenure (November 2014 and March 2015), Majithia filed cases against prominent AAP leaders, including Delhi Chief Minister Arvind Kejriwal, for calling him a “drug lord” in public rallies and press conferences. In November last year, charges were framed by an Amritsar court against Kejriwal, Sanjay Singh and Ashish Khetan of AAP. Despite the allegations against him, Majithia won his home seat Majitha by a margin of over 22,000 votes in the assembly polls this year. However, he continues to be in the line of fire of Congress MLAs, who are pestering Chief Minister Capt. Amarinder Singh to take action against him. Last month, about 40 Congress MLAs led by Sukhjinder Singh Randhawa, the MLA from Dera Baba Nanak, demanded a probe against Majithia by the government’s special task force (STF) on drugs. Rajya Sabha MP and senior Congress leader Partap Singh Bajwa questioned The Tribune’s apology, which he said sounded like a “clean chit” to Majithia. “It is not the job of newspapers to give clean chits. This is not an apology, it is surrender,” said Bajwa in a video message he posted on his Facebook page. Have zero interest in what Mr Majithia does for a living, but The Tribune is a fine newspaper which I discovered when it brought to the fore the issue of the Murthal highway rapes during the Jat agitation. Have grown very fond of the coffee Shri Harish Khare serves his readers on Sunday morning, miss his column when he sets off trekking in the Himalayas. Whether a serving Governor ought to be heading a trust that runs a newspaper is an intriguing question. Would it fetter the Tribune’s editorial discretion in reporting on events in Kashmir, for example ? The apology reminds me of emergency days. I have stopped reading The Tribune I started in my early college days in 1976. Good bye Tribune!